My process is simple. I lay out several pieces, canvases if you will, and just go to town on them. With an entire room absolutely full of vintage jewelry, hardware and other fabulous treasures, I just go on a spree. Pulling out what ever will bring new life to the many cast away pieces lying about. The studio of misfit accessories. These sprees go on for days. It is compulsory, I just don’t, won’t and can’t stop. Sleeping and eating elude me during these sprees. I will take naps while waiting for some of the pieces to set up and dry. Otherwise it is whirlwind of nonstop creativity. I never know what I am going to come up with. I am in the middle of one such spree right now and I have an array of necklaces that go beyond my usual statement pieces. Rising up over an inch high, thick with layers of vintage rhinestone and gemstone pieces of jewelry, these new bib necklaces are wearable sculptures. The gold steam punk crown I have been toying with for weeks is dangerously close to being finished and the new batch of vintage hats I just piked up are screaming for attention. The studio is a sea of beads, gemstones, feathers and more feathers. Candy colors, black on silver, and gold on gold. 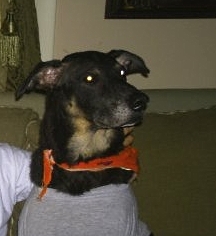 Even my eldest dog got blindsided and is wearing a retro Park Lane black and gold necklace. He always was one for the bling and seems quite proud of his new look. A large necklace fit for my large King, Dino. For now it’s back to work for me. He is a handsome fella.